1) Please play nice. Nobody likes a huffy hedgehog. Contact a mod with any problems. 2) We love picture posts, but please use a cut if posting multiple and/or large (over 400px wide) images. 3) PLEASE TAG YOUR POSTS. Penny crossed over the Rainbow Bridge tonight. I miss that little squeaker. I gave her a warm bath and checked her feet over, but don't see any cuts or any specific place where the bleeding is coming from. A comment in a previous post mentioned getting a wheel liner and changing it every morning, so my question is: what kind of wheel liner should I get and where can I buy them? We use this silent spinner wheel for her. Thanks! Nilla passed away tonight. She had a twisted bit in her intestine. She bloated up. Nothing could be done to save her. She's the one on top. Having a. Bit of an emergency. Nilla is being treated for pneumonia, and also is not eating and is not wanting to poop. They took an xray of her and she is chalk full of gas. She desperately needs to fart. They gave her meds for the gas, but they aren't working. I've tried warm baths, pumpkin, good fiber out cat food, and now I'm all out of ideas. What can I do to help my baby fart? Hi everyone, here's a short video of wedgie snoring. Enjoy! Can I trick train my new baby? I've always wanted a hedgehog but was never in the right place in my life to have one until now. I met my future baby today and put down a deposit. I've been trying to research and learn everything I can before I bring my little guy home. I feel like I've gotten a pretty good handle on care basics, have my cage mostly set up and the rest of supplies will arrive before my little one is ready to come home. I'm going to call him Jawn (John, with a British accent). I was super impressed with the breeder's babies. There were only two in the litter and they were super friendly and mellow. The other had been claimed already and I only got a chance at one because someone backed out of their deposit. At five weeks old they'd been extensively handled and desensitized to noises (probably because the breeder has three...boisterous todlers). My little guy never curled into a ball, and relaxed his quills almost immediately and seemed to enjoy trying to climb into my pocket of my coat. Screaming, running, wiggly children didn't seem to phase them at all. For all his relaxed demeanor he was super alert and curious- I hope his personality stays as fun as he grows up. I hung out for about a half hour with him and he declined following his mother and brother around in favor of checking between my fingers for treats. The one thing that I haven't been able to find much info on is trick training these guys. I had rats years ago and I enjoyed teaching them simple tricks, like coming to their names and sitting on command. I asked the breeder if they could learn their names and he said he'd never really tried to teach one it's name. I realize that due to anatomy it will most likely be harder for them to do tricks, but if I could get him to come when I call him I'd feel accomplished. I was thinking of clicker training for this, but the only thread I found on a hedgehog forum said that most were too scared of the noise. I'm thinking that the clicker might not be too scary to this little guy with his background. 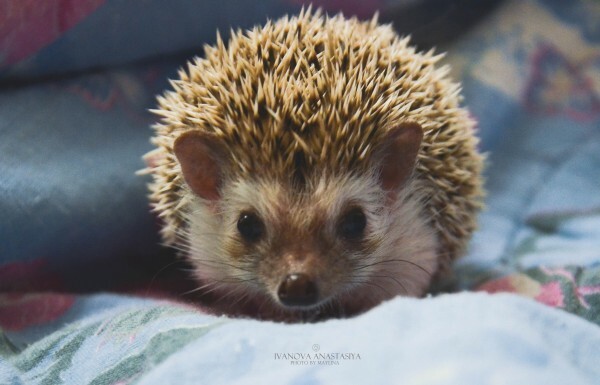 Has anyone tried to clicker train their hedgehogs? Does anyone have a favorite clicker training treat for hedgehogs? Hi guys! We are from Moscow and we're happy to see you here. It is Varfolomey, or Vaflya, or (in English) Wafer. 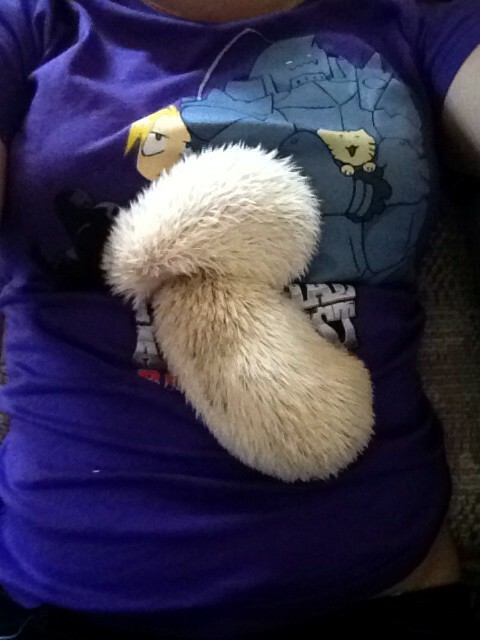 my hedgie and i were chillin on my bed, with me on the computer and him just laying against me. he then decides to crawl down my shirt and was halfway chilling in my bra. i thought it was hilarious and just wanted to share. Tried it but the hedgehogs seem to waste more than they eat of it due to the size of the pellets. The hedgehogs seemed to really enjoy it though. *Disclosure: I received product from MAZURI® Exotic Animal Nutrition to try and all opinions given are my own.